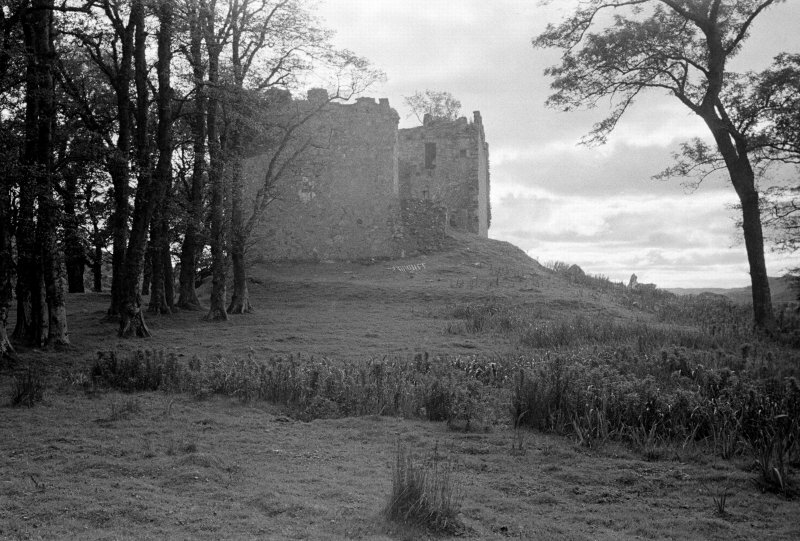 Castle Lachlan. Interior. View of first floor room in N part. 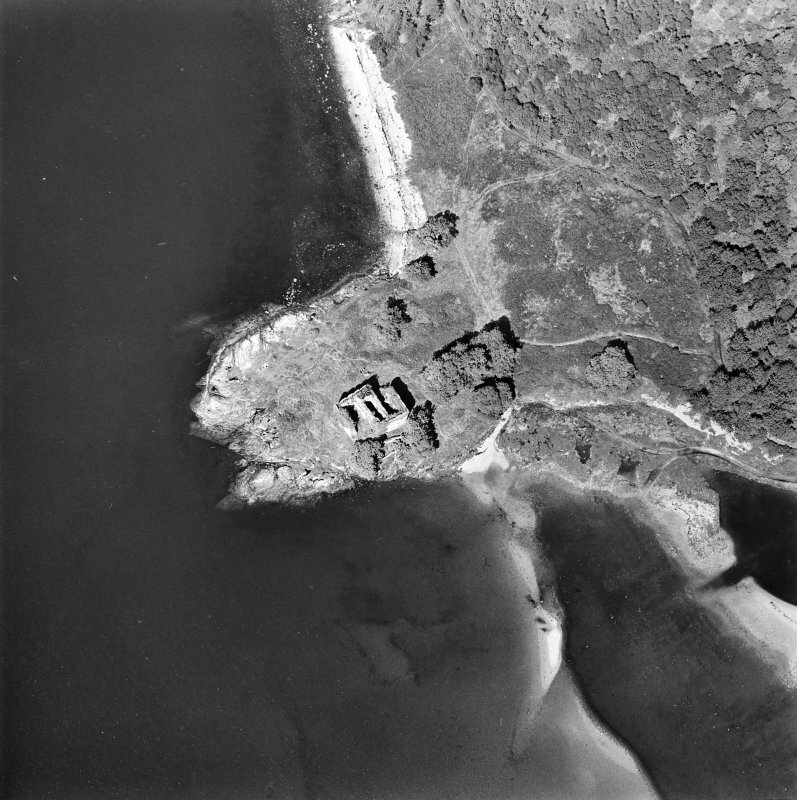 General oblique aerial view of Castle Lachlan, taken from the WSW. 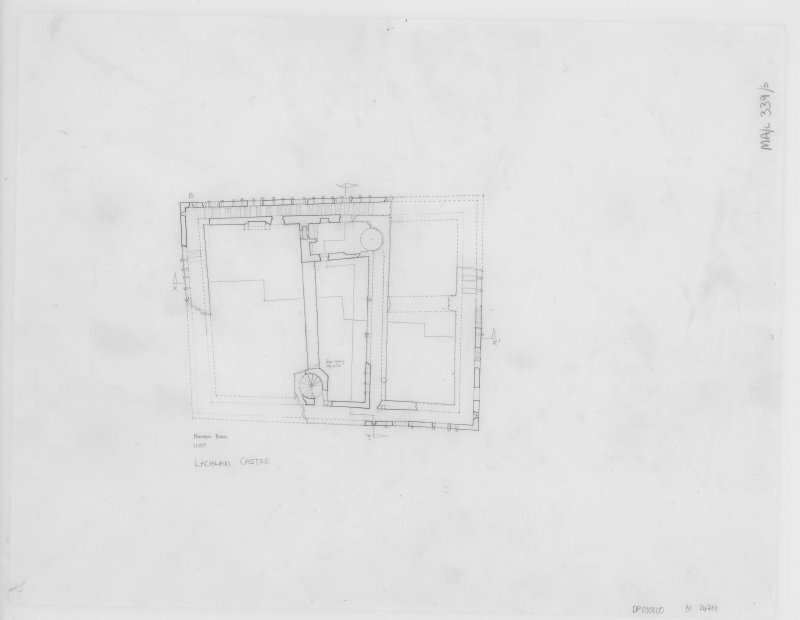 Digital copy of Parapet plan. 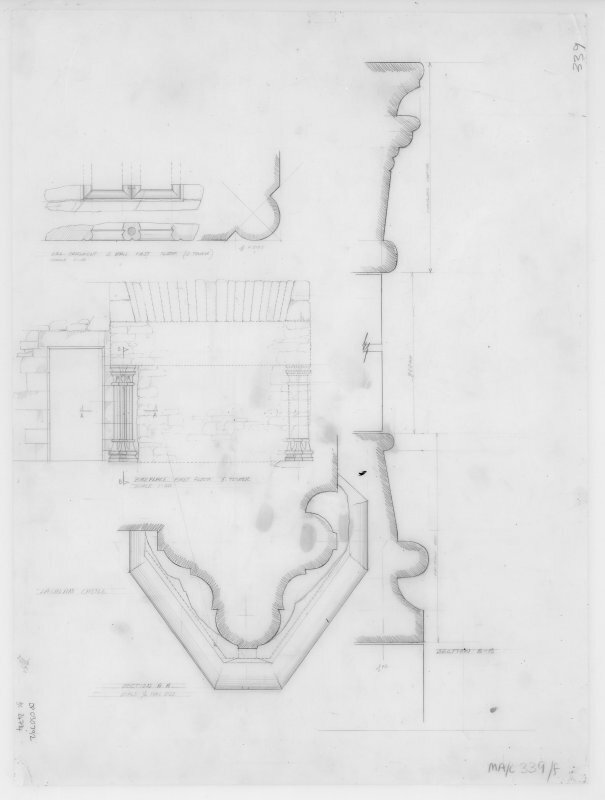 Insc: 'Parapet Plan' 'Lachlan Castle'. Castle Lachlan. General view from West. 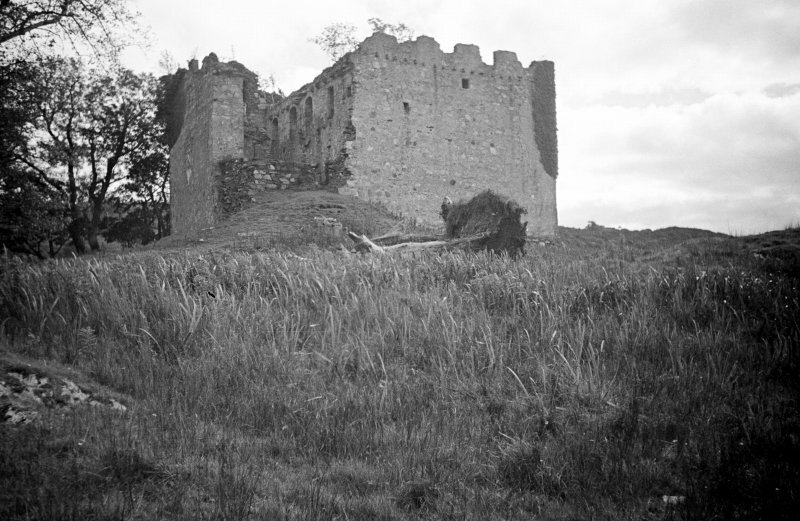 Castle Lachlan. Interior. View from NE. 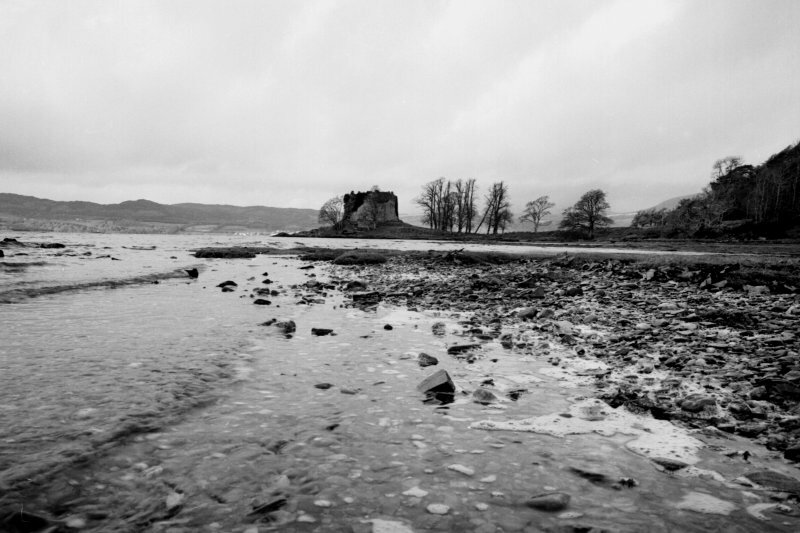 Castle Lachlan. 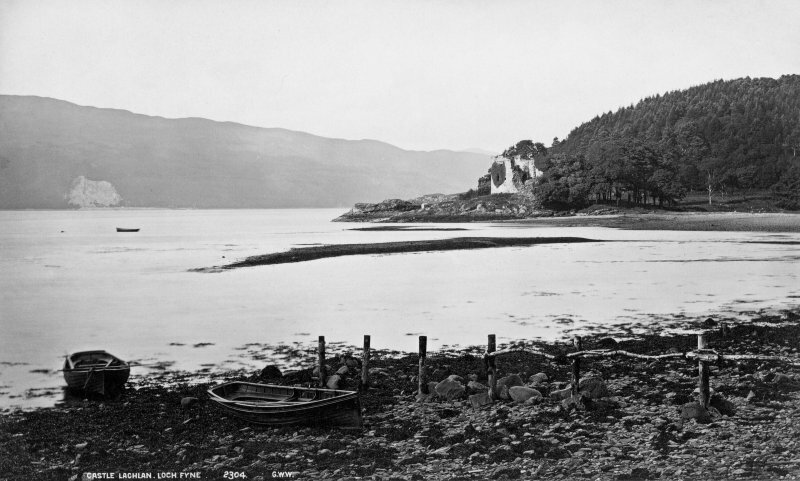 General view from S.
Castle Lachlan. General view from SE. Digital copy of elevations, profile mouldings. Insc: 'Lachlan Castle'. Castle Lachlan. General view from N.
Digital copy of site plan. Publication copy of DC/24791. Castle Lachlan. Distant view from East. 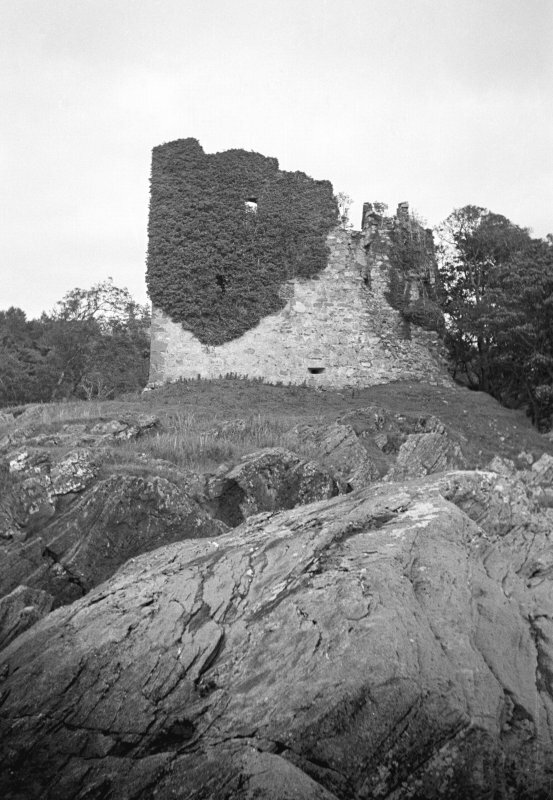 Castle Lachlan. General view from NW. 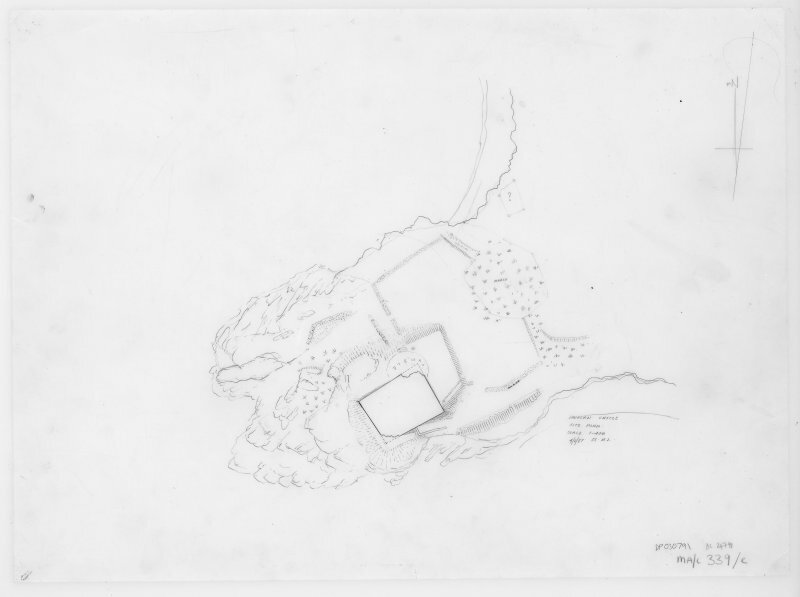 General oblique aerial view of Castle Lachlan, taken from the SW.
Digital copy of ground and first floor plan. 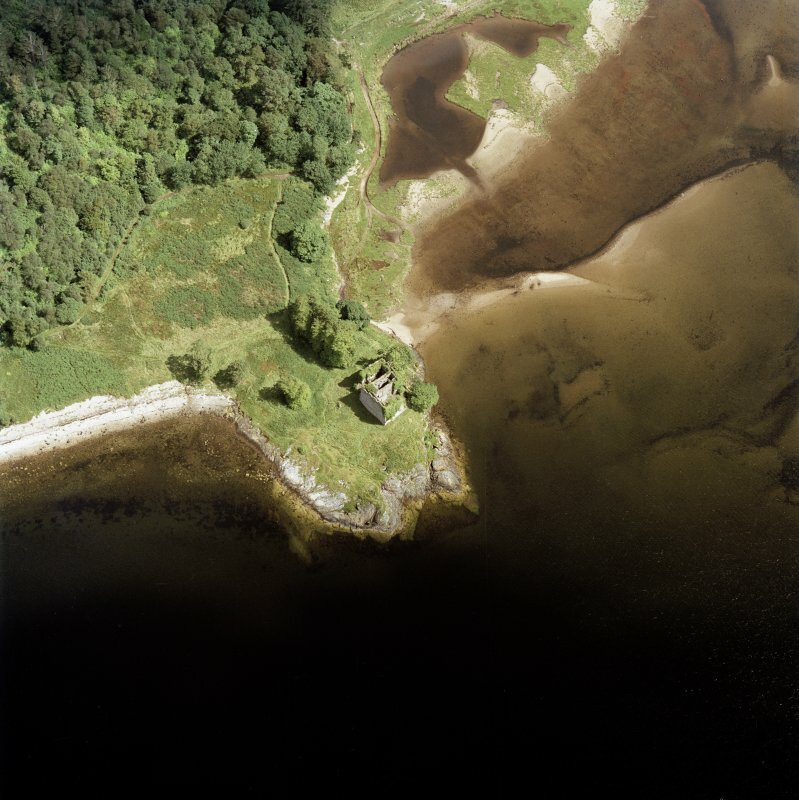 Insc: 'Lachlan Castle ' Cowal' 'Argyll'. 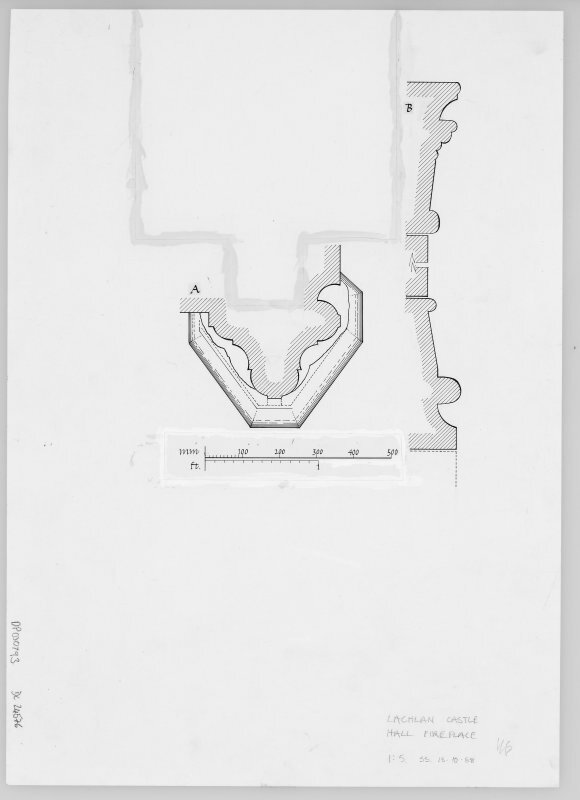 Digital copy of floor plans; ground to parapet. Publication copy of DC/24788, DC/24789 and DC/24790. 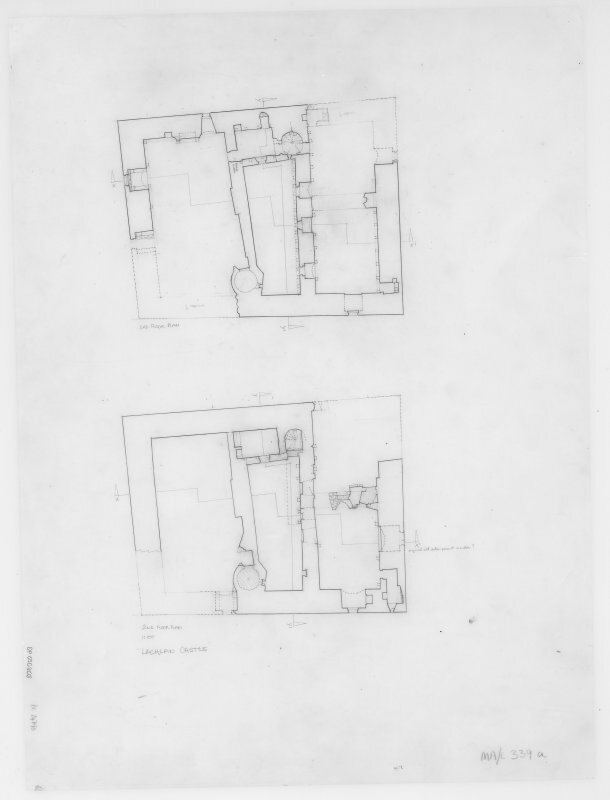 Digital copy of second and third floor plans. Insc: 'Lachlan Castle'. Castle Lachlan. Interior. View of fireplace jamb in first floor room. Castle Lachlan. View of entrance from NE. Castle Lachlan. Interior. View of S wall of first floor room in N part. Castle Lachlan. Interior. View of second floor S portion. Digital copy of profile mouldings of fireplace. Publication copy of DC/24794. Digital copy of site plan. 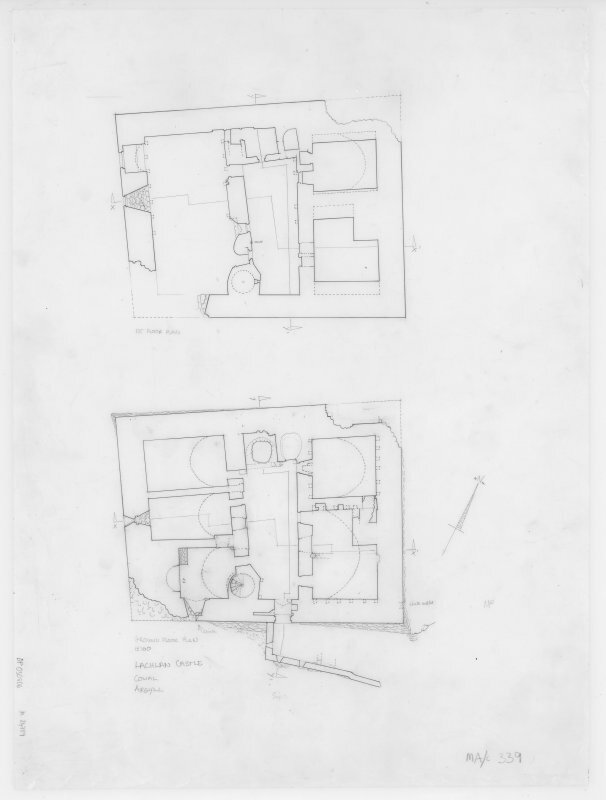 Insc: 'Lachlan Castle' 'Site Plan'. Not to be confused with the country house of the same name (at NS 01298 95563), for which see NS09NW 26. 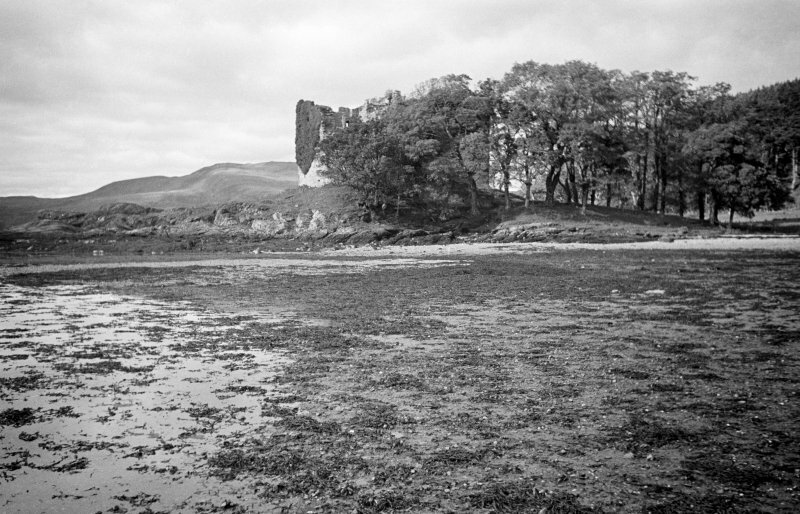 Castle Lachlan, which is probably of 15th century date is of a peculiar form. Externally, its appearance is of a great keep, 70' N-S by 54' transversely, standing 43' high; but on going inside, it is found to consist of two tenements, on the E and W sides of a narrow open court, 12'6" wide by 34'3" long. These two blocks are connected at the N end by a small building containing a room 8' by 7' and a small wheel-staircase. 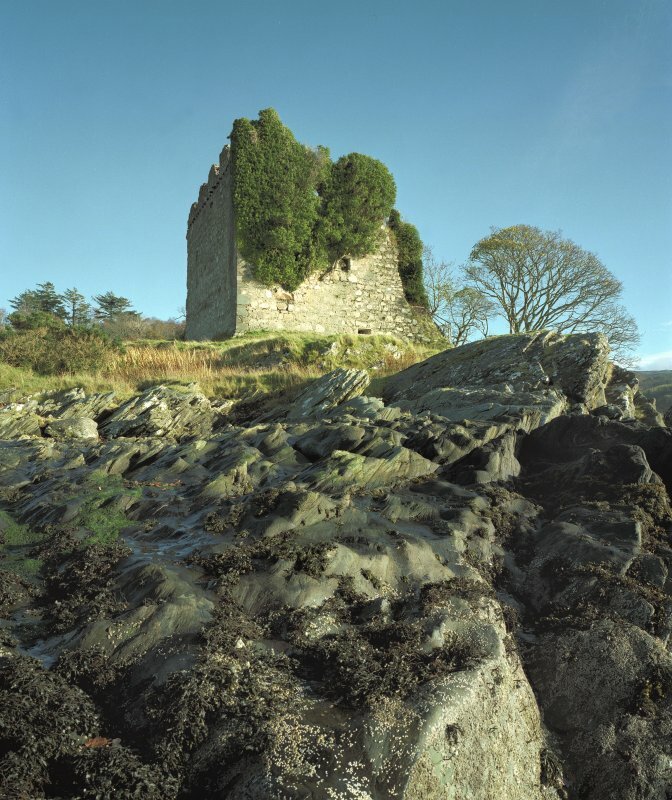 The castle was occupied by the Maclachlans till 1746, when attacked by a government warship; though little damage was done, its occupants fled, and it was never again occupied. Generally as described. The N and S corners have fallen. 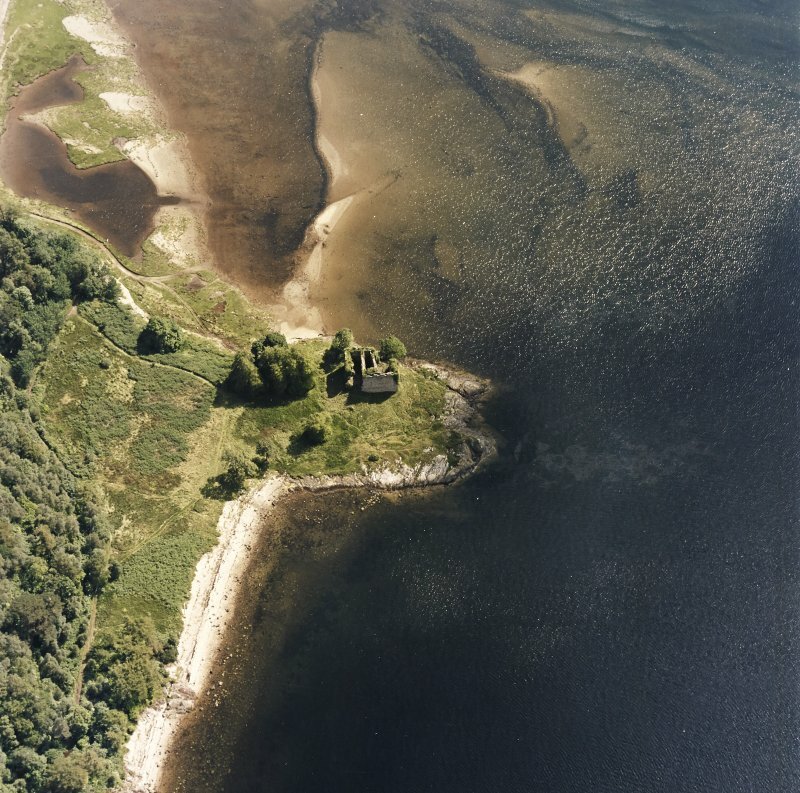 The ruin of this late medieval castle surmounts a rocky knoll only a few metres above high-water level at the w end of a low19 promontory which projects from the E shore of Loch Fyne on the N side of the tidal Lachlan Bay. 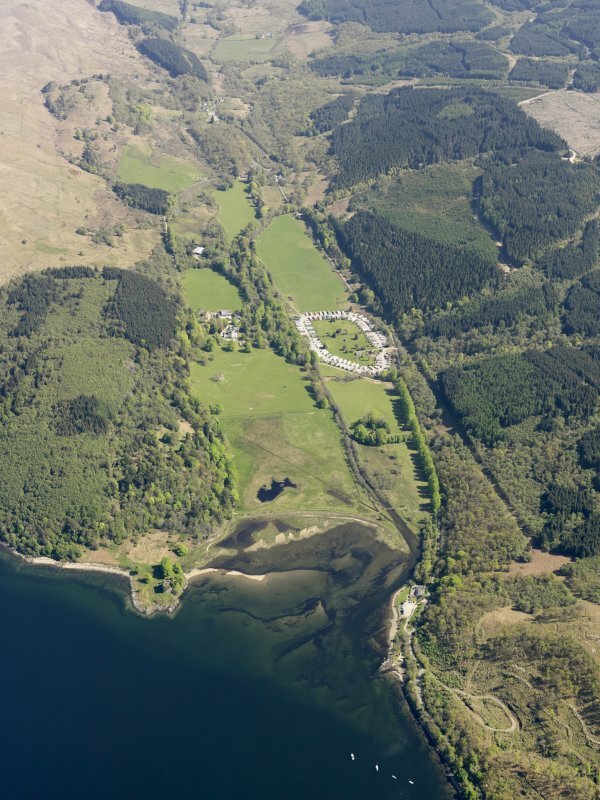 In 1314 Gilaspec MacLouchlan granted a rent from his lands of Kilbride (see No. 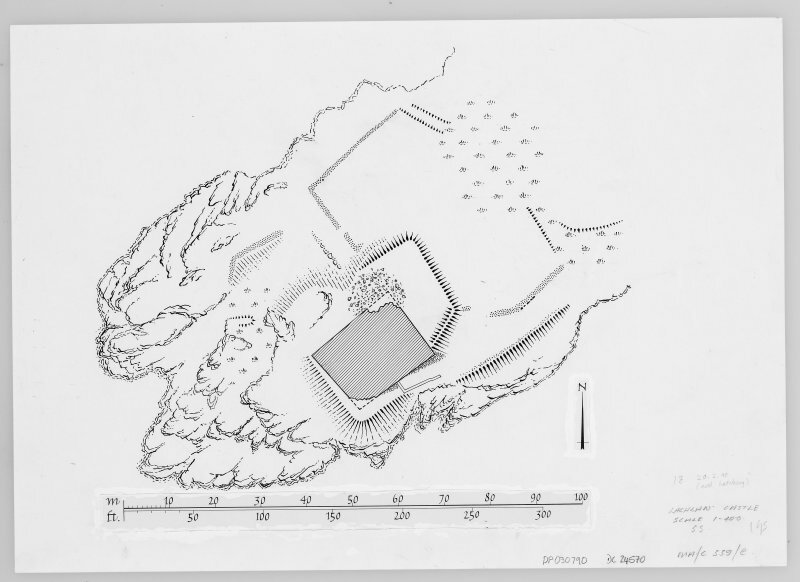 56) beside 'Castlelachlan' by a charter dated at the castle, which probably stood on the existing site (en.1*). It remained the residence of the chiefs of the MacLachlan family until about2M .1l 1790, when the present Castle Lachlan was built in the valley of the Strathlachlan River 0.8km to the ENE (NS 013955). 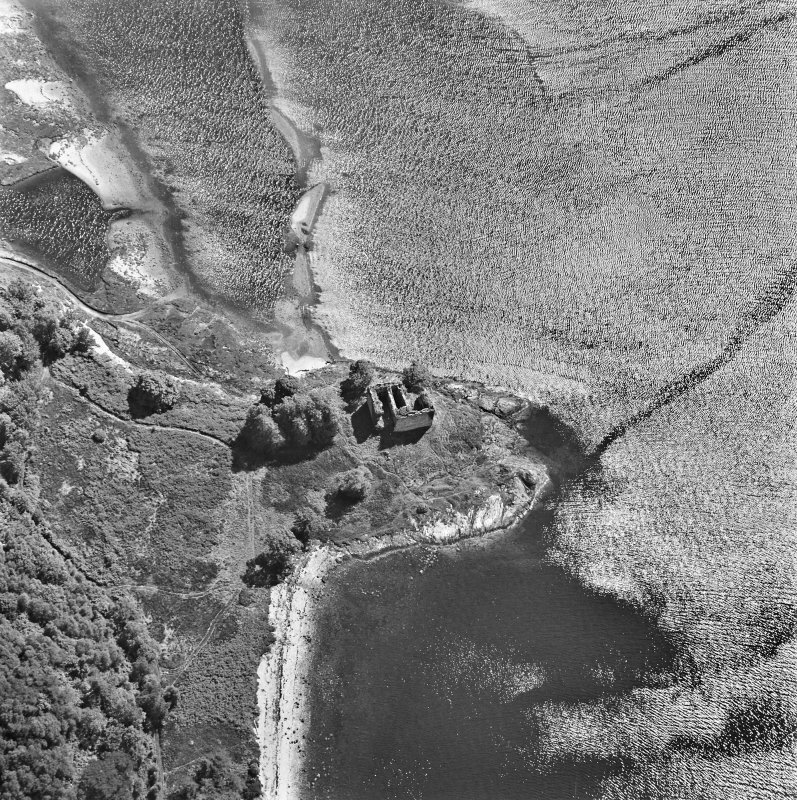 The neck of the promontory, some 150m in width, is spanned by shallow ditches draining a marshy central area35m NE of the castle, and there are slight remains of an angled drystone wall above the shore 25m to the NW. The age of these remains is uncertain, however, and other enclosures to the NW and NE of the castle, including a narrow tree-lined avenue, are probably of 18th- or 19th-century origin (en.2*). A scarped platform bounded on the SE by a low turf-covered wall extends for some 8m from the landward or NE wall of the castle and continues beyond its N angle to a maximum length of 20m, but there was no apparent means of access from the castle, and their relationship is uncertain. 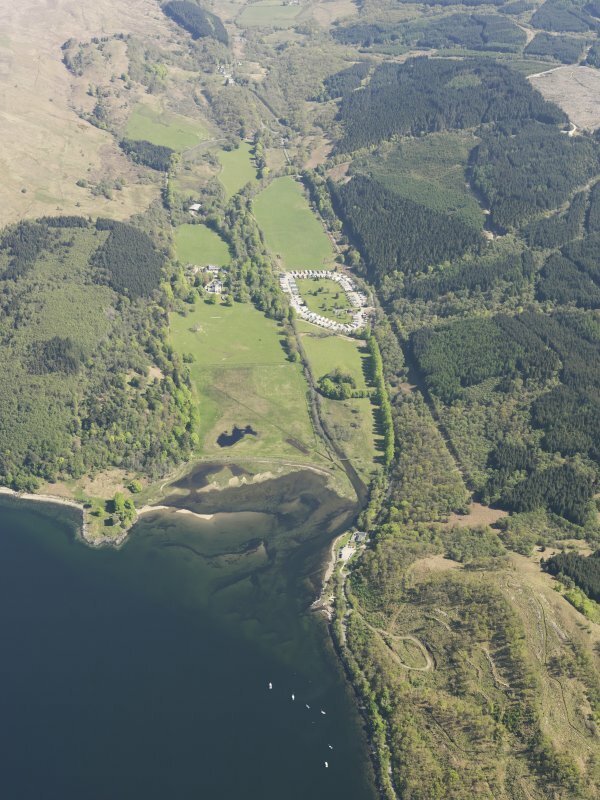 The present approach is by an enclosed ramp of late 16th- or 17thcenturydate built against the SE wall, above a small boat inlet on the rocky foreshore of Lachlan Bay. 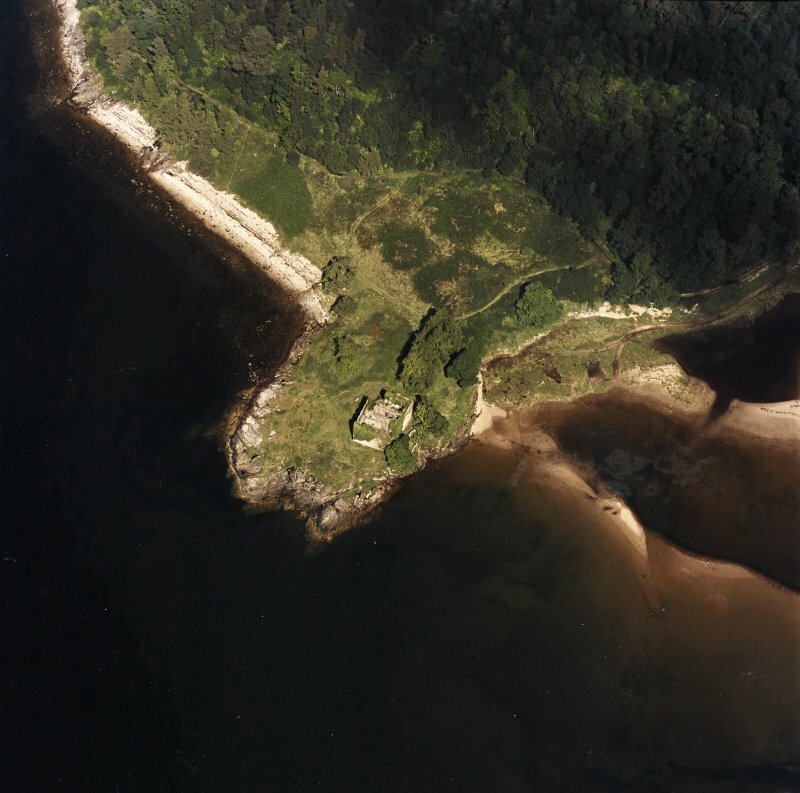 Although the site is exposed to the SW wind, boats could also be drawn up on small shingly beaches at both sides of the promontory, and there are traces of a possible building or boat-noost close to the shore 60m NE of the castle. 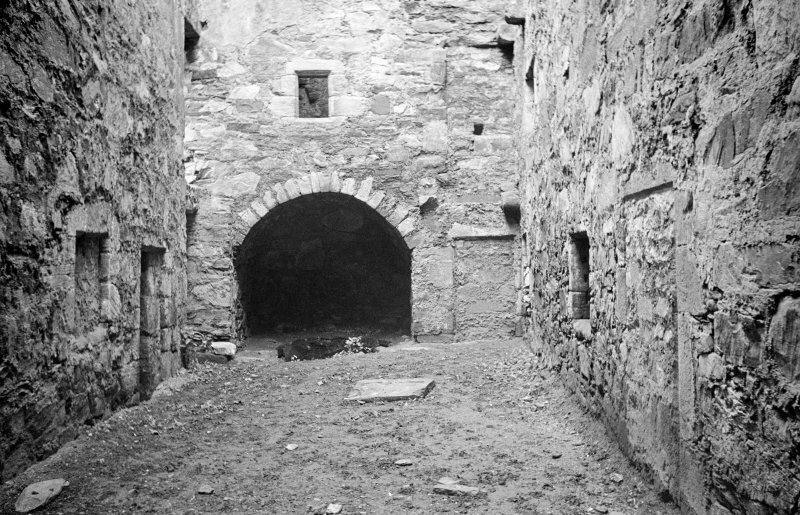 The castle comprises a quadrangular enclosure entered by a central archway in the SE wall and divided into two ranges by a narrow transverse corridor or courtyard. 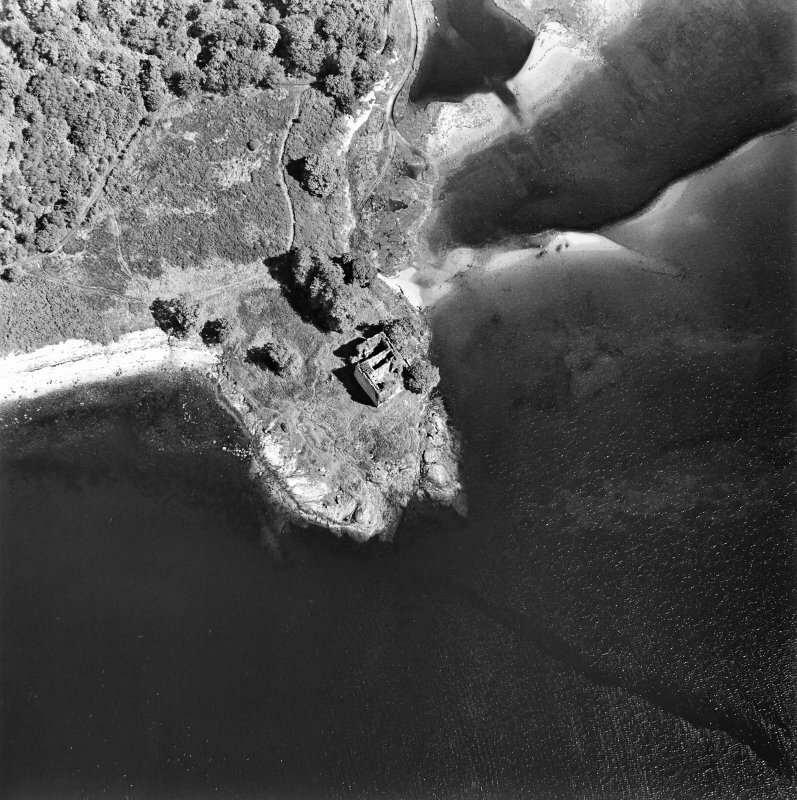 The plan of the enclosure with its obtuse N and Wangles closely resembles that of Castle Sween (No. 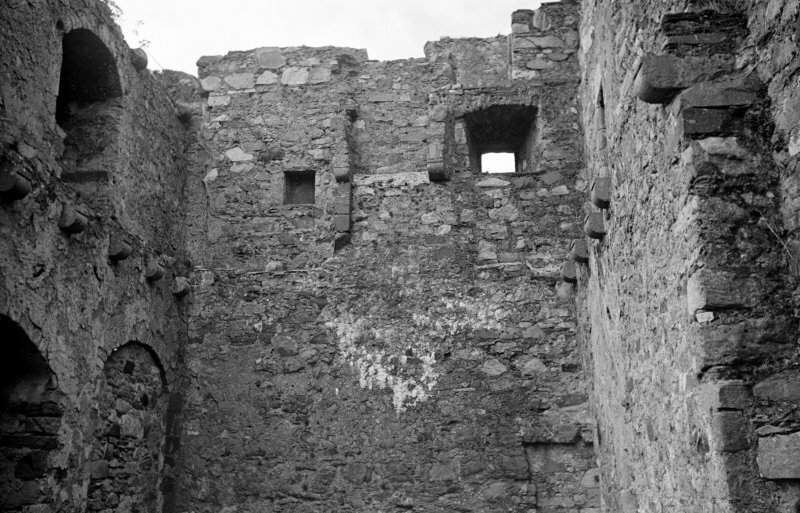 119), although on a smaller scale, and it may have been influenced by an earlier building on the site, but no remains of the castle recorded in 1314 can be identified. 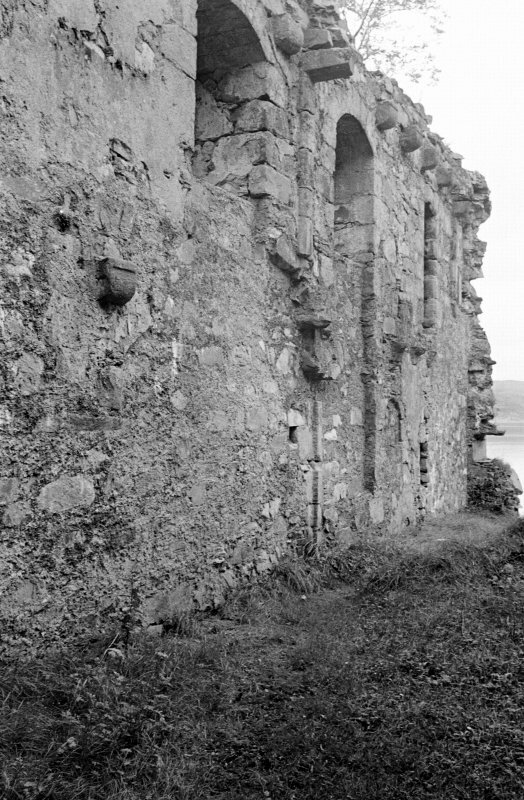 The curtain-wall is probably of early 15th-centurydate and a series of blocked openings indicates that the division into NE and SW ranges with differing floor-levels was an original one, although the existing internal structures may be dated to about 1500 by their elaborate fireplaces, and the SW range, containing the principal hall, was probably widened at that period. 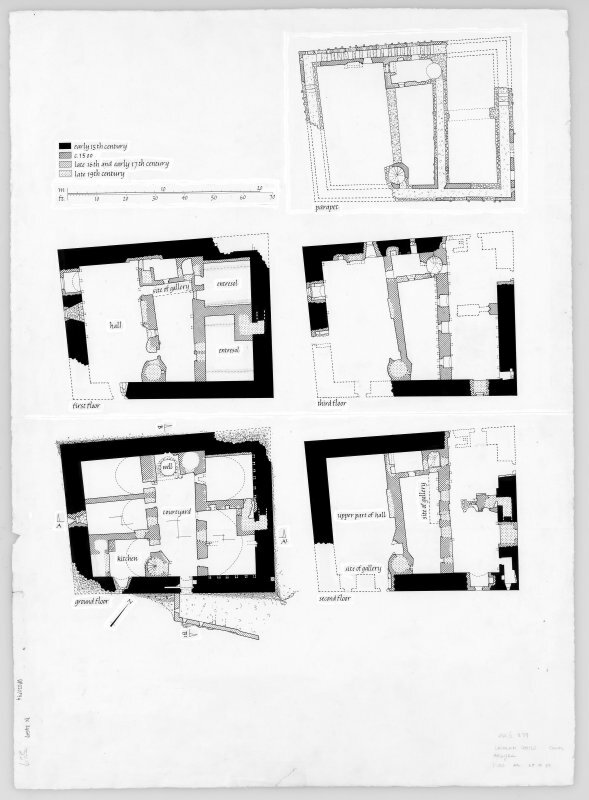 The original plan, with its slightly larger courtyard, may be seen as a development of the late medieval layout of castles such as Castle Sween and Innis Chonnell (en.3) with their large hall-ranges and private blocks, adapted to a confined site to produce a remarkable anticipation of the Renaissance plan of Drochil Castle (Peebles-shire) (en.4). 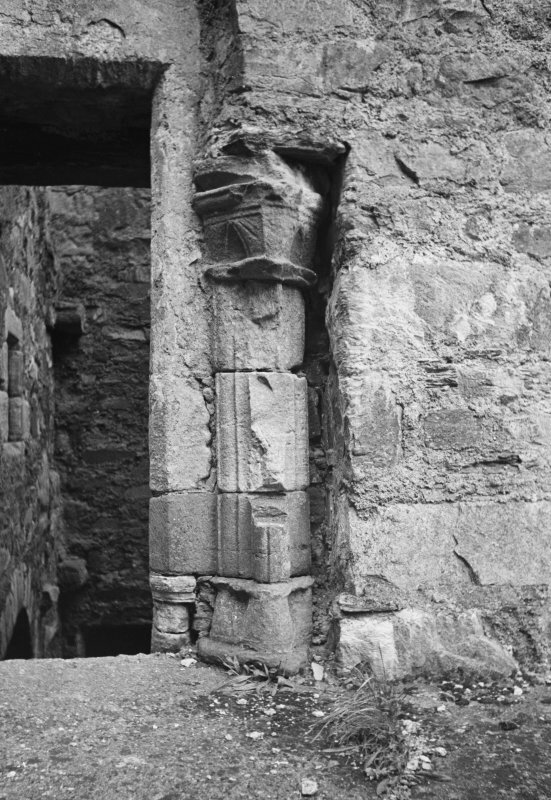 The two ranges are connected at the NW end of the courtyard by a narrow building incorporating a newel stair and a series of small rooms above a ground-floor well. 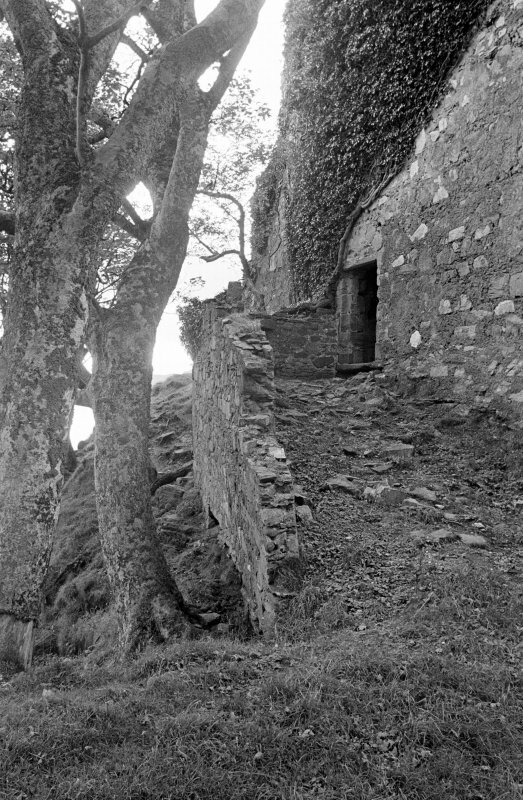 This stair was linked, by corbelled timber galleries above the courtyard, to the first-floor doorway of the SW hall-range and to the principal floor of the NE range, whose floor-level as l.5m higher because of the differing heights of their respective vaulted ground floors. Provision for firearm defence was made in this early-16th-century phase, and musket-loops were added at wallhead-level and in the SE forework, probably at about the end of that century. Some alterations were made to the NW stair-tower at about that period, and in the NE range during the 17th or early 18thcentury. 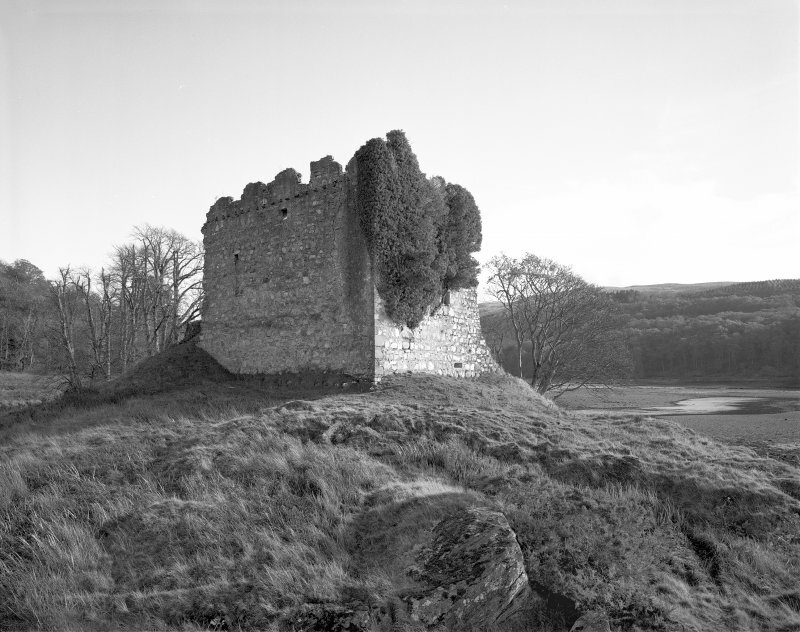 The castle was garrisoned by Campbell militiamen during the rebellions of 1715 and 1745, in which the MacLachlans supported the Jacobite cause, but an engraving of about 1790 (en.5) shows that only the NE range was still roofed at the time when the new house was being built. 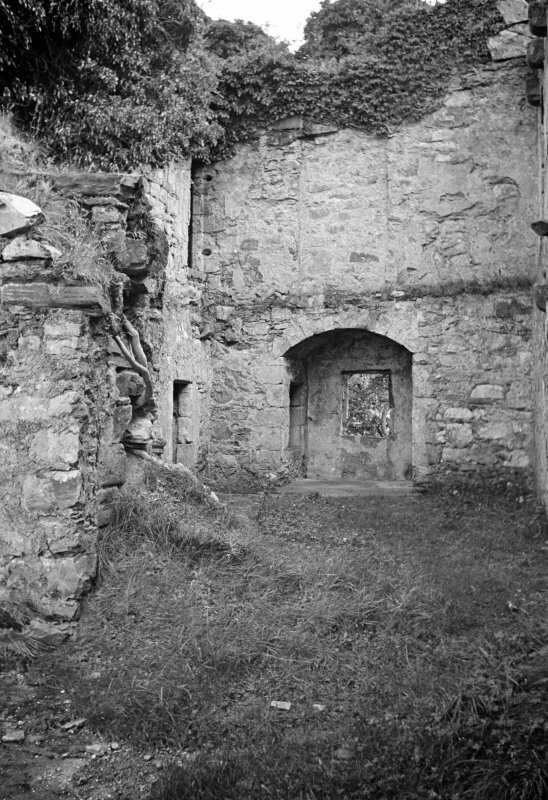 The N and S angles collapsed some time after 1830, and the walls were extensively repointed, many openings being blocked, shortly before MacGibbon and Ross surveyed the building about1890 (en.6). NS 00527 95280 A watching brief was carried out, 14 March 2013, during the construction of external and internal scaffolding at Old Lachlan Castle. No finds or features of archaeological significance were observed. NS 00530 95280 A narrow trench 0.4 x 3.5m was hand excavated in August 2015 through the ramp leading up to the entrance of Old Castle Lachlan in order that the collapsing retaining wall could be manually pushed upright and consolidated. The ramp was shown to consist of loose stone rubble. The retaining wall had been rebuilt and added to on a number of occasions and the latest phase of rebuilding incorporated some of the ramp rubble into the rough foundation. Various 19th-century artefacts including a roof slate, broken bottle glass and ceramics were recovered from the topsoil.